Hydrologic and Hydraulic Modeling, FEMA Floodplain Remapping (CA) | WEST Consultants, Inc.
After conducting a peer review of the City’s xpstorm model, which includes approximately 24 miles of major streams and rivers, WEST Consultants was asked to implement proposed corrections and re-calibrate the model based on rainfall and stream gage data for the New Year’s Flood of December 31, 2005. 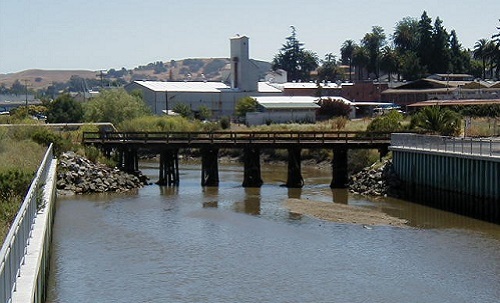 After calibration, WEST was asked to incorporate previous recommendations to enhance the model and then to update the FEMA 100-year and 500-year floodplain and floodway boundaries for the Petaluma River. This effort was needed for FEMA mapping to reflect the flood control project recently completed by the U.S. Army Corps of Engineers in the downtown area and floodplain changes in other areas of the City, including Willow Brook, Corona Creek, Capri Creek, Lynch Creek, Washington Creek, East Washington Creek, Adobe Creek, Kelly Creek, and Thompson Creek. WEST modified the City’s xpstorm model to include hydrologic calculations based on the SCS method throughout the watershed (imperviousness, lag, and curve number were estimated for each subbasin). The rainfall frequency depths were developed based on a statistical analysis of a local precipitation gage with 95 years of record, including an adjustment to account for the interval correction between daily rainfall totals (midnight to midnight) and the annual maximum 24-hour period. A unique rainfall depth was applied to each subbasin for each frequency storm (2-, 10-, 50-, 100-, and 500-year frequencies) based on the 1982 storm distribution. WEST provided summaries of anticipated flooding for each reach of the Petaluma River and its nine tributaries within the City limits. Flow breakouts along the tributaries were modeled with additional links and nodes down residential streets in order to determine the flooding extents. Sea level change was estimated based on gage analysis. A unique GIS floodplain mapping solution was developed to accurately depict the floodplain for the 100- and 500-year events based on results at model nodes.